When you want to a solid hair metal album, who do you call? BEAU HILL, that’s who! 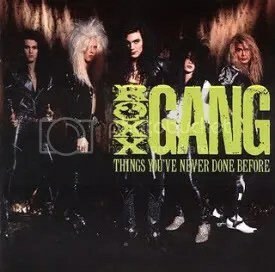 Roxx Gang was a band that I had heard of forever, but never attempted to track down any of their stuff. I think I picked this one up off a few years ago CDUniverse.com the same time I picked up Rough Cutt’s Rough Cutt/Rough Cutt Wants You. It’s a shame that band fell apart in the face of the looming alternative movement because they’re definitely a band of solid sleaze rockers. I guess they just came in too late to really make a difference and cement themselves. After making waves with their Love’em and Leave’em EP, this was the only full album the band released before breaking up in 1991 (they got back together and released a few albums from 1995-2001). This album did fairly well though, selling 250,000 copies. Pretty good, I’d say. The band went on to sign with Sony’s Epic Records but never made it to the 2nd album thanks to fighting in the band and with the label itself. Definitely a sleaze rock album worth looking into with “No Easy Way Out”, “Red Rose” and the bluesy “Ball ‘N Chain” sticking out as the best material.